Blame for the U.S. loss at Gleneagles in 2014 could easily have been credited to the Euros, who played magnificently. Instead, with Phil Mickelson behind the wheel, Tom Watson was made the fall guy on the road to Ryder Cup redemption. On Saturday night of the 2014 Ryder Cup, American players huddled in a team room at Gleneagles Hotel in Auchterarder, Scotland. Tom Watson spoke. So did Phil Mickelson. Through sources in the room, an ESPN report would later describe it as a tense and uncomfortable gathering, and it would become the preamble to one of the most bizarre Ryder Cup Sundays in history. Down 10-6 to the Europeans after a disappointing afternoon session, the U.S. needed to rally in Sunday singles to win for the first time since their 2008 triumph at Valhalla, and for just the third time in the last 10 meetings. Watson, the team’s temperamental leader, was brought back as a 65-year-old captain to rekindle his magic on European soil. He was the captain the last time the U.S. won an away match, in 1993 at the Belfry. But on this night he wasn’t in the mood for his customary captain’s gift, a replica Ryder Cup trophy signed by the team. He said he wanted the real one. One source told ESPN, “He said it basically means nothing to me.” Watson’s pep talk was more of a scolding. The whole ordeal left the room sour—Mickelson included. KEEGAN BRADLEY, U.S. TEAM MEMBER: I remember it being different than Medinah [in 2012]. Medinah was such a fun atmosphere, and this was different. It could have been because we were getting our asses kicked. But it was a much different vibe, and we knew that going in; this wasn’t going to be like these other teams. [Watson] was going to come in, be a different captain. Sometimes it works and sometimes it doesn’t. ZACH JOHNSON, U.S. TEAM MEMBER: [Watson] did what he could do to the best of his abilities. I don’t begrudge the PGA of America, either. [With] his Ryder Cup record and stalwart résumé, I see the logic behind [them picking him], but he didn’t know many of us, both on and offthe golf course. So that part was unfortunate. To understand the nature of the tension that was mounting, and the mess that eventually spilled out very publicly in the infamous 2014 Ryder Cup press conference, you’ve first got to understand a bit about captain Watson, the team’s inspirational leader Mickelson, and their testy relationship. Golf Channel insider Tim Rosaforte reported that Mickelson wanted early on to be a part of the Ryder Cup decision-making process, but calls to Watson months before the event went unreturned. Ted Bishop, the PGA of America president at the time, said he thinks it’s “highly doubtful” that Watson wouldn’t have returned Mickelson’s calls. Bishop, however, said he believes Mickelson was irked when Watson said publicly that Tiger Woods, if healthy, would be a captain’s pick. Mickelson never received such public reassurances but eventually auto-qualified regardless. TED BISHOP: [Watson and Mickelson] are headstrong individuals. They’ve both got very strong opinions. In some ways they’re very much alike, and in other ways they’re totally different. The Americans faced a monumental task at Gleneagles. Heavily favored Europe had four of the top six players in the world, anchored by top-ranked Rory McIlroy, who had just finished blitzing the golf landscape to win the British Open, WGC-Bridgestone and PGA Championship. Even Europe’s highest-ranked player outside of the top six, Martin Kaymer (12th), won the Players and U.S. Open that year. 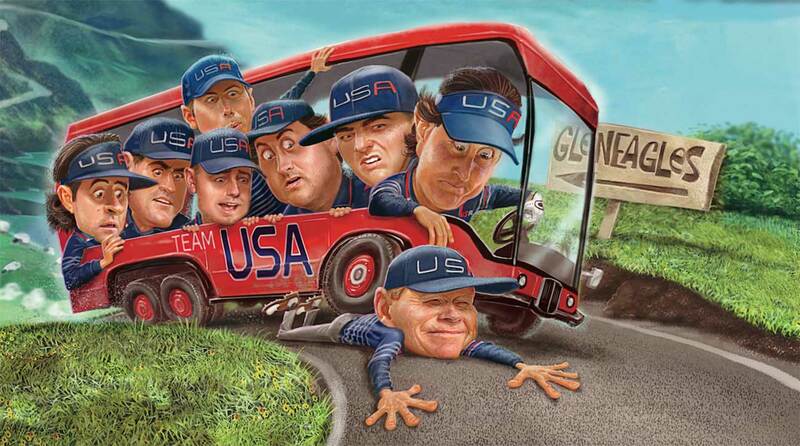 All the while, the Americans were without Woods (injury), Dustin Johnson (voluntary leave) and Jason Dufner (injury). Its top-ranked player was Jim Furyk, at No. 4. BISHOP: The conversations I had with Watson, there was some concern I think about our team and about who wasn’t on the team. Saturday night’s pep rally did little to help the Americans’ dreams of a comeback. The U.S. lost the session and the Cup, 16 1/2 to 11 1/2. Behind the scenes and in the media, Watson’s pairings, decisions and strategies were being scrutinized. MARTIN KAYMER: You could feel there was something off, but obviously you didn’t know what it was. I think they had a bit of a lack of team spirit. At Gleneagles, it was Phil Mickelson behind the wheel on Sunday night. Eight questions had been asked and less than nine minutes passed before the camera turned to Mickelson on the evening of Sept. 28, 2014, at Gleneagles. With his teammates spread out to his left on the dais, and captain Watson sitting a mere dozen feet away, Mickelson was about to change the course of the U.S. Ryder Cup forever. “Phil, and anyone else who was at Valhalla,” a reporter started, “can you put your finger on what worked in 2008 and what hasn’t worked since?” Mickelson paused, then spoke carefully for two minutes, although if felt like an eternity. (The body language of Hunter Mahan, who was sitting next to Mickelson, proved as much.) While he never looked in his direction nor mentioned Watson by name, Mickelson’s glowing praise of Paul Azinger, who’d lead the Americans to victory six years earlier at Valhalla, spoke volumes. “He got everybody invested in the process.... We were all invested in each other’s play.... We had a real game plan,” he said, before finishing. “Unfortunately, we have strayed from a winning formula in 2008 for the last three Ryder Cups, and we need to consider maybe getting back to that formula that helped us play our best.” ALAN SHIPNUCK, SENIOR WRITER, GOLF : When Phil said that you could hear the press kind of inhale, and everyone was like, “Wait, did that just happen?” BRADLEY: Well, we all wanted to say a lot of stuff. Phil is kind of our unofficial spokesman for the team. He’s the guy we look to. I don’t think what he said was that bad. I was shocked at the kind of criticism he got. JOHNSON: I had no idea [it was coming]. And I didn’t know all the specifics behind it. Probably still don’t, which is probably a good thing. Twenty-three more questions were asked that night. Mickelson answered 10 of them. He refused to admit that he was taking a jab at Watson or his leadership style. “I’m sorry you’re taking it that way,” he told a reporter. But his most damning six words were these: “Nobody here was in any decision.” MORE: Watch the infamous '14 Gleneagles press conference BISHOP: I was on the right-hand side of the room, and I was absolutely shocked watching what was going down. BRANDEL CHAMBLEE (FROM A GOLF CHANNEL BROADCAST): That was as close to a one-man mutiny as I’ve ever seen. I think that’s a moment that Phil would like to have back. WEBB SIMPSON, U.S. TEAM MEMBER: Tom Watson is a great guy and did a lot of things well, and so I don’t put the blame on him. What the commentators missed out on that week was how well Europe played. There was so much focus on us not playing well, which wasn’t the case. Europe played unbelievable golf. At the notorious Sunday night press conference, Mickelson let fly—with Watson just feet away. JOHNSON: As a competitor I was bitter, but at the same time I quite frankly appreciate how — maybe it wasn’t the forum to do it — but I appreciate how Phil became kind of our big brother there and stood up for the team. Watson, sitting silently, was asked to respond to what Mickelson said of Azinger. “I had a different philosophy as far as being a captain of this team,” he said. “You know, it takes 12 players to win. It’s not pods. It’s 12 players.” TIM ROSAFORTE (FROM A GOLF CHANNEL BROADCAST): I have never been in a news conference like that, where something was so awkward as that was, and it was interesting to see Tom react the way he did. GARY VAN SICKLE (WRITING IN SPORTS ILLUSTRATED): At the far end of the room, where vice captains Andy North, Raymond Floyd and Steve Stricker sat right in front of me, the seat-squirming was noticeable. KAYMER: I think it’s pure frustration from [Mickelson], who is so much into the Ryder Cup and who likes winning so much that it really got to him. It was quite emotional for him too, which shows a lot of the passion. Furyk was asked to comment on the back and forth between Mickelson and Watson. “Gee, thanks,” he said, sarcastically. “Just sitting over here minding my own business.” Asked if Mickelson was being disloyal, Watson said, “Not at all. He has a difference of opinion. That’s okay. My management philosophy is different than his.” JIM FURYK: I didn’t [see it coming]. Saturday night, I wasn’t like, “Oh, God, there’s a rift; something’s going to happen.” When it’s over, you’re disappointed. You’re at your weakest point. The only thing you can say is that they played better. BRADLEY: We all were pretty frustrated, so it could have come from anybody, but again, Phil is our guy. Phil is the guy we look up to on that team. Mickelson’s displeasure likely festered after a Saturday benching. He and Bradley sat all of Day 2 after a 1-1 Friday. BISHOP: The first day at Gleneagles, Mickelson and Bradley are playing a par 3, and Phil comes up to Tom and he says, “Captain, I just want you to know as it relates to the pairings this afternoon, that in the last five years of international team competition, I have only missed five fairways.” Of course, he was lobbying for he and Keegan to play in the afternoon. And they won their match, and obviously Tom plays him in the afternoon. They go out, and they’re just getting hammered. Watson walked up to them on the ninth and he’s got his arms crossed and he looks up at Bradley and Mickelson and he says, “Well, I just have one question. When are one of you guys gonna hit a fairway?” And just walked away. And those guys—they just got pounded. Friday night’s loss — a 3-and-2 drubbing courtesy of Victor Dubuisson and Graeme McDowell — led to Watson benching Mickelson and Bradley on Saturday morning. They sat again for their weakest format, alternate shot, that afternoon. It was the first time Mickelson had sat for an entire day in his Ryder Cup career. Prior to the benching, Mickelson and Bradley were 4-1 as a team in Ryder Cup play (and 2-1-1 at the Presidents Cup). The buddies went 1-1 on Friday, and were benched the next day. BISHOP: I wasn’t there when [Watson] went in and told them [they weren’t playing], but when he came back out he said they weren’t happy. And Phil was texting [Watson], lobbying to get in the lineup, and of course, Tom didn’t budge. BRADLEY: We still went and warmed up. Phil told me to go warm up as if we were going to play, because we figured there’s no way he was going to sit us all day.... You know Phil, he lives for playing on these teams, and we were—the word I can only say is shocked. We had such success over the past four years, whether it was the Presidents Cup or Ryder Cup, and then we had beaten Rory and Sergio the day before. We were one down with three to play and we won. The word is shocked. We were both, “Whoa, this is crazy.” TOM WATSON (IN A 2015 SENIOR BRITISH OPEN PRESS CONFERENCE): Phil was very disappointed about not being able to play. It was kind of sour grapes. That’s understandable, and we just got waxed, the whole team, and the disappointment was just there. We let our hearts talk for us. I did everything I could in my own mind with the help of my captains and the PGA to do everything possible to have us win, and the other team was better. [Watson declined to be interviewed for this story.] BISHOP: To this day, I believe that had Phil played Saturday afternoon, I’m not sure that what happened on Sunday night would’ve ever happened. 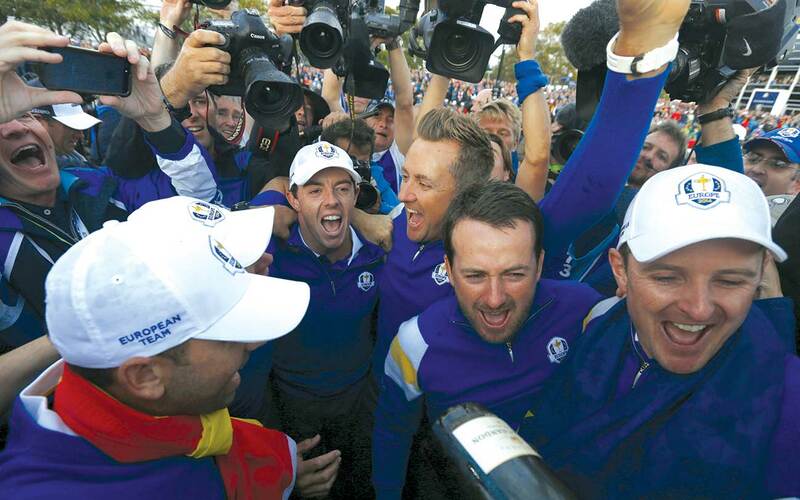 At Gleneagles, the Euros celebrated their sixth Cup win in the previous seven meetings. One week later, after ESPN.com published a story with unnamed sources revealing details of the explosive Saturday night team meeting, Watson issued a statement through the PGA of America: “First, I take complete and full responsibility for my communication, and I regret that my words may have made the players feel that I didn’t appreciate their commitment and dedication to winning the Ryder Cup,” he said. “My intentions throughout my term as captain were both to inspire and to be honest.... As for Phil’s comments, I completely understand his reaction in the moment.... The bottom line is this: I was their captain. In hindsight, whatever mistakes that were made were mine. And I take complete and full responsibility for them.” BISHOP: The next week or two, it was tough for Watson. The tables got flipped on him based on a lot of those things that were said. And true to form, Tom really didn’t have much to say about the whole thing publicly. That’s his style. He didn’t really defend himself. Within a month of Gleneagles, the PGA of America announced the formation of the Ryder Cup Task Force, made up of players, past captains and PGA brass. (Bishop says discussions for such a gathering were underway before the calamitous presser.) The committee included Mickelson and Woods—no Watson. In February 2015, the Task Force gave way to the newly created Ryder Cup Committee, its duties to decide future captains and handle all other Ryder Cup decisions. The original members were Davis Love III, PGA CEO Pete Bevacqua, PGA president Derek Sprague, PGA VP Paul Levy, Mickelson and Woods. BISHOP: Tom was the first guy that I called and told him what we were going to do.... Phil was the second person I called, where it was basically kind of put up or shut up time. “You know everything we need to do to fix this thing, now you need to be part of it.” And he agreed. That Sunday night in Scotland, Mickelson was pulling the strings for major changes to come. He knew his reputation was at stake in 2016 at Hazeltine, where Davis Love, who’d so passionately led Team USA in the ’12 Cup, was restored to the captaincy. The Americans dominated, walloping Europe 17-11 (with Lefty securing 2 1/2 points). PHIL MICKELSON: At Hazeltine, all the players were coming up and thanking me. That’s what means more to me, because that emotional experience you go through in a Ryder Cup with those guys brings about relationships and experiences you cherish the rest of your career and life. SIMPSON: I think we are now past the point where we don’t have camaraderie. We have camaraderie. Tiger and Phil care so much about it. 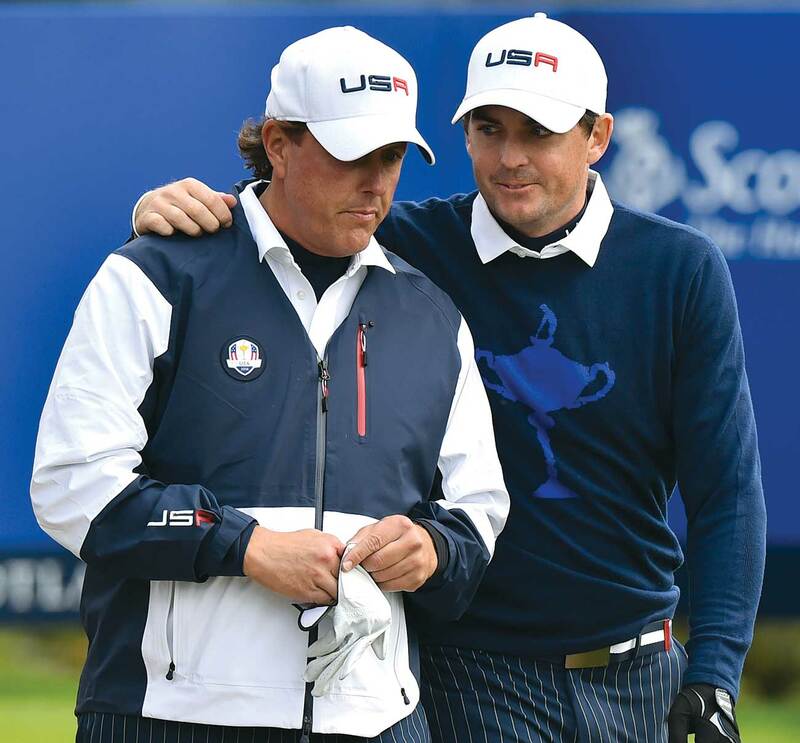 BRADLEY: What happened at Gleneagles really changed the Ryder Cup for the U.S. forever. In the long run, it’s actually going to be a good thing. MICKELSON: A lot of the guys that were on the winning team in ’16 were also on the team in ’14—Jordan Spieth and Rickie Fowler and so forth, a lot of the young guys. They are going to have multiple Ryder Cups in their future, and I want their experience to be really positive. And it will be. How did Phil spell relief in '16? B-u-b-b-l-y.